3 Queen Bedrooms, 2 Full Bathrooms, Sleeps 8 (Including Double Pull-out Couch. Our long term renters have left and with a fresh coat of paint we're ready to offer the chalet once again! We've been written up! Check out the April/May 2010 issue of Su Casa magazine. Toro Amarillo is an alternative to the intense heat of the coast with average temperatures of 26C / 79F during the day and cooler nights for comfortable sleeping. We are centrally located just over an hour from San Jose's Juan Santamaria Airport between the Pacific and Caribbean coasts. You can head to either coast to explore what each has to offer. A contemporary design with soaring 30ft ceiling over the living and dining area, modern kitchen with a full set of appliances, granite counter tops, and a 3rd floor loft entertainment center. The front half of the chalet is glass to take full advantage of the awesome mountain views! We share the valley with El Silencio Lodge which offers superb dining and Spa facilities. El Silencio Hotel – A couple of steeper hills and stairs but generally a fairly easy walk to three different waterfalls. Stay for lunch and take advantage of some of the Spa’s offerings. The La Paz Waterfall Gardens – A gentle downhill walk through various open air enclosures and gardens for monkeys, birds, butterflies and reptiles as you pass by a series of waterfalls. Various nurseries and coffee plantations to visit. San Jose – The suburbs of San Jose have excellent dining, shopping and cinemas. Catarata del Toro – Hike or rappel down into the gorge of a 270 foot waterfall! Walk the trails and stay for lunch! Fly fishing. There are trout ponds just a couple hundred meters from the chalet and lots of rivers – bring your tackle! Arenal Volcano, hot springs and lake (be sure to make a reservation). A large and luxurious full bathroom with jacuzzi on the second floor and a bathroom with shower on the first floor. Enjoy a beautiful view of the mountains through our fully glassed front wall! The surrounding area offers many sites and activities including canopy tours, nature reserves, ATVing, horse back riding, fly fishing, hot springs, plantation tours, para gliding, Sarchi's handicrafts, private Spanish lessons and much more. Give us a list of your favorite foods and we'll stock the fridge for your arrival! Bajos Del Toro is a beautiful little village, set in an unbelievable part of the Costa Rican country side. There's a million things to see if, you don't mind alittle driving then some hiking. Waterfalls galore. Volcanos seemingly everywhere. Fantastic and patient people actually everywhere. If you're into the eco-tourism aspect of vacationing, this is your dream vacation. A guide is highly recommended. We used Kenneth at "Toro Amarillo 360" Eco-tours. He's local, is very knowledgeable and knows everywhere to go. The two small village restaurants were great and so was eating at the trout farms in the village. NENE's was fantastic and one or two of the family actually speaks English too. The chalet was comfortable and is fairly modern. The views, from the predominantly glass house, are simply fantastic. You can watch the sunrise on the surrounding mountains and watch the birds flying all over. Post card views in every direction. Everything we needed to cook was there. There were also some hiking poles and other outdoor equipment in the mud room, for our use. We loved to sit at night with nothing more than the back deck lighting on, as it lit the house and property perfectly. The chalet even has a daily feline visitor (Calypso) who will make you feel at home, even if you don't have a cat. The decor, inside and out, is casual, comfortable and relaxing. As another guest commented, there are some minor issues though. We too noticed the broken cabinet hinge. All it took was finding the screw, in the cabinet and putting it back in. I took care of that. The stair railing cables are still not repaired, there are a couple of exterior light fixtures that need to be remounted (plants growing out of them) and the general cleanliness of the house could have been better. My only real concern was we found the washer did not work and, when I informed the property manager, three days into our trip, he said he'd send somebody to fix it or stop by himself. When we left, 5-days later, we'd still not seen or heard from the manager and the washer hadn't been fixed. Overall, we have still recommended the chalet to several friends who are currently planning to also rent it. We too plan on returning in the near future. A fantastic house, in a fantastic place, with fantastic people. You make the rest of the trip fit your definition of fantastic. Baja del toros is a wonderfully small and out of the way place with many waterfalls and access to many of the things that make Costa Rica wonderful, starting with its people. The home we stayed in was comfortable and relatively modern, particularly as compared to the surroundings. Everything worked and it was adequately stocked. There several minor issues such as cabinets with broken hinges, lack of overall cleanliness, broken wiring in multiple places in the stair railing etc. The only major area of concern was a the smell of sewage from the mud room we encountered upon reaching the home. The owner was very responsive to messages left with the app, but the local contact did not answer phone calls or return messages. The smell was mostly fixed after a 2-3 days and we received a small refund for the inconvenience. It returned intermediatley but was never as bad. The internet access through WiFi was dismal. No vent for cooking but opening windows and doors helped clear the air. Overall, we really did enjoy the place. If not for the smell, I think I would have rated the home much higher. We were all great full for the opportunity to visit Costa Rica again. Glad to hear your party enjoyed their time at the chalet and Bajos del Toro. The odor was caused from a crack in the laundry drain. Thankfully keeping the mud room door closed and using the front entrance limited any exposure. The odor was not reported before or after this visit, nor did the staff notice any issues, so it appears to have been resolved. Although the maintenance and cleanliness issues were reported as relatively minor, it is not acceptable to us that they were not addressed. We’ve spoken to our house manager to ensure they are resolved and that he is responsive to our guests. The chalet is not located in the Central Valley so we do not have the luxury of a fibre internet connection, although it is possible there were some provider issues during the stay, browsing and email are well supported. 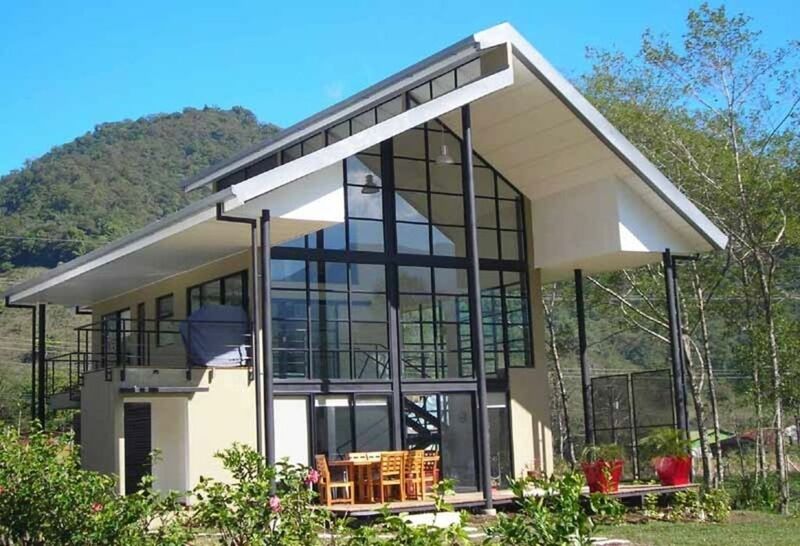 This chalet has everything you need to be comfortable in Costa Rica. From a BBQ on a balcony to an outdoor dining table on the back deck. There were days I didn't even leave the house while staying here because I enjoyed it so much. Located ~30 minutes from the town of Zarcero where you can get all your groceries, supplies, etc. if the local shops don't have what you need, and within 2-3 hours of both coasts, and 1 1/2 hours from San Jose and Escazu, you just can't find a better location! Connect with Kenneth Ugalde with Ecotours Toro Amarillo 360, who has a kiosk in town. He's the local expert in the area and will take you to some amazing sites and adventures that will make your family and friends and home drool with envy. P.S. Please say hi to and give lots of love to the gray kitty, Calypso, and the small black/white/brown spotted dog, Cody, for me (you'll know her by her voracious whole boddy wiggle but and happy demeanor). They became my pets during my month stay here. I WILL be back!!! Thank you, Christopher, for being a gracious and attentive owner/host! I appreciate you and Vinicio were fantastic to work with during my stay. Enjoy this slice of heaven! We enjoyed our stay in this mountain retreat. It can be a challenging drive up there but my husband got used to the roads weirdly fast and after that it was all fun - literally there was something fun or a new adventure in any direction you took from the house. The house owner did share useful tips about getting there and going about which was very helpful. Glad we stocked up on our way in Zarcero as the nearest supermarket was at about 20km drive by curvy roads with potholes. The house had an amazing design and mountain views all around. We did enjoy our stay, I gave the house 4 out of 5 stars since in the beginning we had a few technical issues but those were taken care of shortly. The mornings were breathtaking so we enjoyed our morning coffee out on the deck. It was our first time in such climate so we were shocked of the temperature changes, cool nights and mornings and hot days. So by noon it was hot and we generally took off to some adventure, waterfalls everywhere around, older kids did water rafting at Pozo Azul which was great, and since we also had a toddler we stayed at the farm on the premises. We loved it. We did not go gaga for the La Paz waterfall garden tho, I feel it's overrated and overpriced and it's just a nice zoo, but if you have lots of time then it could be a nice place for kids. We did also venture to Arenal (2,5 hr drive) and absolutely loved the Tabaccon hot springs! The 5 nights went fast and in the end we were left with the memorable smells and sounds of the surrounding nature and a great experience. Thanks for taking the time to review us Brigitta! We're always glad to hear our guests enjoyed themselves and took advantage of the wide range of activities in the area. The cool nights are one of the things we love about the area as AC is not required to get a comfortable night's sleep but you can still enjoy the pleasant daytime temperatures. Driving in Costa Rica can certainly be an adventure but as you say, 'you get used to it' and taking it slow is the way to go! There is a pretty good grocery in town but we generally recommend Zarcero as it is on the way and has a very large assortment of items given the size of the town. The topiary in front of the church is fun to check out while you stop. I'm surprised you weren't that fond of La Paz but of course it depends on past experiences. I really like the place: playing with toucans and those jaguars! All the best and safe travels! The house is beautiful with stunning views of the surrounding valley. It is well appointed, particularly in the kitchen. The local village is well served and very pretty but it is quite remote. Lovely home, lovely community, amazing people! We do not like touristy, busy vacations. We were looking for nature, the simple life and getting away from it all. This place fit the bill! Yes, getting there (that road!) was an experience, but as Ticos say "you get used to it." The house is something else! It is an architectural beauty! Be aware that you have to climb a steel, secured to the wall, ladder to get up to the 3rd floor loft which wasn't a problem for us, but could be for some. The outdoor jacuzzi is not working, but the indoor jacuzzi tub does work. We had no problem with wifi and the television had English channels (although we didn't watch much tv.) What we really enjoyed is walking to the village (3 minutes) and getting to know the people at the restaurants, stores and the local bar where our family (kids too) ate many nights. The bar owner accommodated our various dietary restrictions w/help from a local who spoke English. The local market there has basic items and food. However, I would load up w/groceries in Sarchi before going over that mountain road! It's far and the road is not for the faint at heart. My daughter got a fever and fell ill one night. I panicked a little as we were far from a hospital. I called the property manager Jadir, who was great. He called the village nurse and she came over at 9:00 at night and gave my daughter some type of extensive glandular massage on her arms and stomach w/olive oil plus had her drink some concoction with lemon, soda water and salt. In the morning my daughter was 100% better! Oh, and the price? Nothing. She said it was a "present." My daughter also went to the medical clinic for an infected toe. We got antibiotics and the price? FREE! The people there are so NICE! We really made a lot of friends and connections in that small village. Yes, we did the El Silencio hike and lunch which was breathtaking and delicious, and we went ziplining in La Fortuna, swam in the thermal pools, etc, but it was truly the people there that made our vacation! Now back to the house; we had no problems. It's got everything you could want! We did temporarily adopt a little gray tabby cat who came morning and night, like clockwork to get some food. If you see him, please give him a pet and an snack. He is homeless, like many cats and dogs there. Christopher was great to deal with. You have a beautiful home in a beautiful setting! By the way, BRING A THICK SWEATER! It gets chilly at night and rains sometimes! 5 STARS! Thank you for your comments Laura. We always appreciate feedback. I'm very glad to hear you enjoyed your time and really connected with the people. Costa Rica has so much to offer and the happy, friendly people make everything so much more special. 1. Unfortunately we have given up on our outdoor Jacuzzi and it is not advertised for use anymore. It has been impossible to get parts and service in a timely fashion and has proved to be somewhat unreliable. As you note, the indoor two person Jacuzzi tub is available. 2. Yes, the roads in Costa Rica can be a challenge. Ours is just finishing a construction phase and is much improved. 3. Our house manager Jadir generally takes our guests shopping on the way to the chalet but I believe you were too late arriving for this. The village has a pretty good grocery store now but certainly completing a shopping in Sarchi or Zarcero makes the most sense. 4. We are located about 20 minutes from a major hospital (Zarcero or Sarchi) but there is a doctor in the village Monday to Friday and of course the nurse you met is generally available at any time. We're happy to rent on a long term basis so let us know what your plans are and we'll provide you a competitive quote.